No matter if the weather is warm or cold, cyclists across Wisconsin need a top-notch spot to buy a bike, get some repairs, replace parts, and pick up any of the additional gear they made need. Fortunately, there is an array of options when it comes to bike shops in Wisconsin, all equipped with the product and knowledgeable staff you seek. Here are the 10 best in the state. Wheel and Sprocket offers a wide variety of bicycles for purchase. They also carry tons of bike gear from clothes to gloves. After opening their shop over 40 years ago, Wheel & Sprocket is one of the best bike shops sharing their passion and knowledge to all. Machinery Row Bicycles sells road bikes, triathlon bikes, mountain bikes, commuter bikes, and more! Conveniently located in Madison—it’s a favorite shop to all the surrounding areas. Buys accessories like helmets, locks, lights, bells, and bike parts. Ask the knowledgeable staff at Machinery Row about all of their brands! Rent bikes hourly, by the day or for week at the Bike Fixers. They carry some of the best brands on the market along with providing services, tune-ups and repairs. They’ve been voted the “Best of Milwaukee” five times over the course of their almost 20-year life! Share your passion of bikes with those who enjoy it just the same. 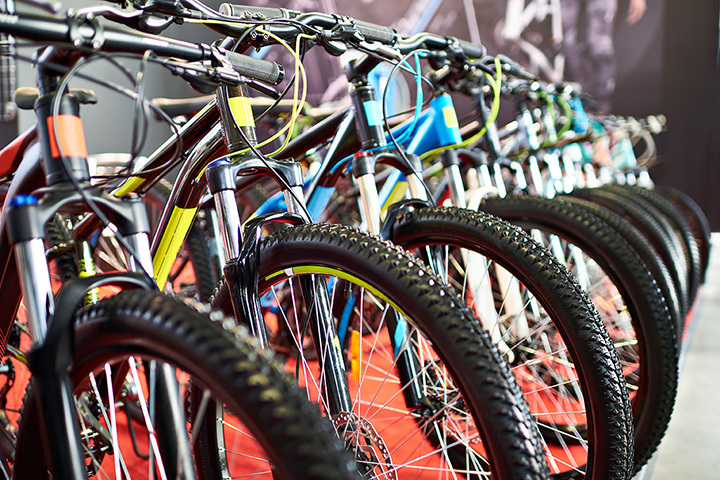 The Bike Hub offers tons of excellent brands of bikes for those looking to purchase new. They also offer services and repair packages. Everything from helmets to car racks—you’ll find everything you need. Curious about the winter biking we mentioned before? Momentum Bikes rides together every Saturday morning, no matter the season. Enjoy their large store filled with tons of equipment and bikes. Rest assured knowing their top-notch service will fix your bike right up. Stadium Bike located in Green Bay is the perfect place to bring your bike in for maintenance. They offer a full-service repair center for all type of bike makes and models. Trade up your previously bought Stadium Bike for in store credit towards a new one. You’ll love their awesome brands and knowledgeable staff. Smith’s Cycling and Fitness is one of six recipients in Wisconsin for the Bicycling Friendly Business Gold Award. Find all the greatest name brands at Smith’s from Trek, Electra, Surly, and more. Stop in to tune up your bike or schedule an annual maintenance package. Trail This Bicycle Shop located in Mt. Horeb is a full-service bike shop and carrier of outdoor supplies. Their fun new location is stock full of great bike inventory for purchase. Purchase clothing, helmets, tires, wheels, parts, shoes, and car racks. Located on the Glacial Drumlin Trail in Dousman is the Bicycle Doctor and Nordic Ski Shop. Service your bike for a basic tune, super tune, or premium tune. Shop their sales floor for rental bikes, parks, wheels, clothing, helmets, shoes, car racks, and more. Z-Best Bikes is one of z-best hometown bike shops. Rent bicycles to travel around downtown Minocqua by or stop in and get your bike repaired quickly at their service desk. Purchase all of your bike necessities in one spot for a great low price.